Can A Biological Father Challenge Florida Paternity Law? A judge in Port St. Lucia will hear testimony and receive evidence to determine if it is in a 3-year-old child’s best interest to have his biological father take a paternity test to establish paternal rights, including custody and visitation. In this case, the biological father, John Karpinski states that he and the child’s mother conceived their son while she was estranged from her husband (a fact not disputed by mother). Mother has since reconciled with her husband and they both wish to raise the child as their own without Mr. Karpinski’s involvement in the child’s life. Mother’s position is well-supported by Florida Paternity Law. According to Florida law, a biological father is denied parental rights when the child is born into an intact marriage and the spouses wish to raise the child as their own. Ultimately, the judge must make a determination as to what is in the child’s best interest. The “best interest doctrine” provides the judge with guidance and important factors to consider when making a decision that will affect the child’s happiness, security, development, and overall well-being. In this case, the court appointed a guardian ad litem to provide the judge with recommendations, testimony and evidence relevant to the child’s best interest. Courts often appoint guardians ad litem in cases relating to custody, visitation, divorce and adoptions, to represent the child’s best interest. The primary function of the guardian ad litem is to provide the court with facts. 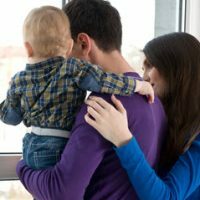 Here, the guardian ad litem recommends against the biological father having parental rights, citing that the child has already established a strong bond with mother’s husband and that it would not be in the child’s best interest to disturb that relationship. Each side of this litigation will produce expert testimony and documentation from specialists and other professionals to help support their argument. In cases such as these, you need a skilled advocate attorney that is knowledgeable of the factors that a Florida court will use to determine what is in a child’s best interest. Contact experienced Florida family law attorneys to protect your rights and the rights of your children. Ultimately, Mr. Karpinski has the burden of proving that it is in his son’s best interest to have a relationship with him and that denying Mr. Karpinski his parental rights would be detrimental to the child. Mr. Karpinski is asking the court to put aside well-established Florida Paternity law and rule in his favor. Mr. Karpinski must make a strong and compelling argument to sway the court. On the other hand, Mother must also make a strong showing that the child would be harmed in some way, and that it is not in the child’s best interest to have a relationship with his biological father. If you need legal representation to help you make a strong and persuasive argument for the best interest of your children, contact the skilled Orlando Florida attorney team at Arwani Law Firm ,.